This VacuEasylift VM300 has a yoke with 4 adjustable suction feet. 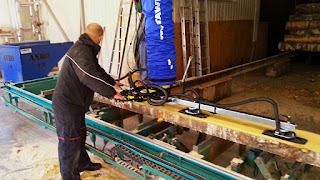 By using the vacuum lifter long and thick unprocessed wooden slabs are lifted from a machine, rotated and then placed on pallets. The lift can handle weights up to 270 kg. With VacuEasylift vacuum lifter large and heavy wood slabs can be handled in a safe, easy and ergonomic way. VacuEasylift can be used to lift e.g. various sorts of sheets and panels. Click here to view a video of how VacuEasylift is used to handle large sheets in an area with very little operating space.